How do you change the robotic pool cleaner game irrevocably – and up the stakes on sheer value? You’re looking at the answer. 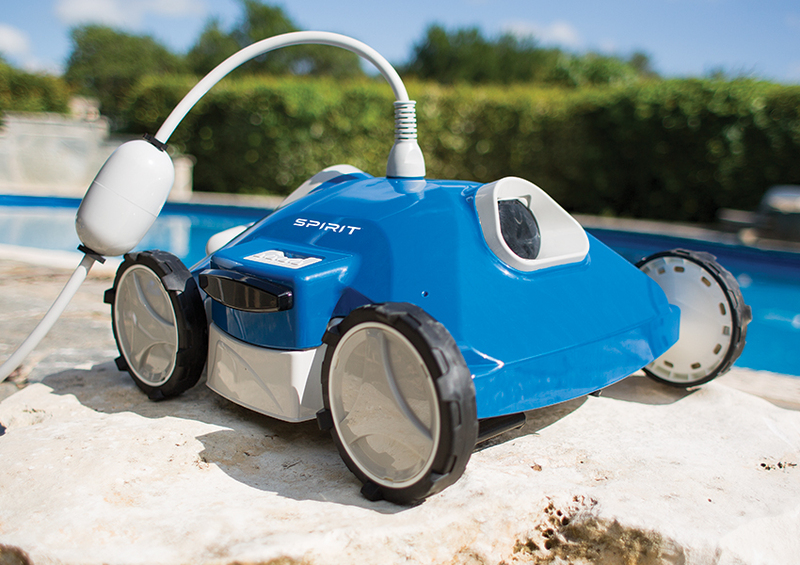 The Aquabot Spirit reflects the robotic pool cleaner expertise that has been developed over the last 30 years. The Spirit delivers breakthrough efficiency and class-leading features that go far beyond anyone’s expectations. We didn’t stop there. We added an ingenious TwinBodyTM Innovative Chassis for super easy access to everything. Cleaning is now quick and easy. Unlike all other robotic cleaners in the price range, Spirit is the world’s only value price cleaner to feature a genuine 360 degrees anti-tangle swivel. Say goodbye to tangles. The brand new Anti-Tangle Swivel delivers peace of mind that your new pool robot will do the job without suffering from the dreaded spaghetti cord tangle. We designed the swivel to spin free 360 degrees without restrictions. Now you can spend more time relaxing and less time fussing with tangles. Best-in-class filters handle more dirt and debris than any other cleaning method. Two oversized filter bags capture fine particles and contaminants down to 2 microns in size. Dual bags allow you to get in more cleaning cycles before having to clean the filter bags. The top-loading filter bags are easy to remove and clean in seconds. The Innovative TwinBody™ Chassis finally makes it easy to gain access for cleaning and maintenance. The engineers cleverly split the chassis in half and provided easy access to everything with the simple push of a button. There’s no need to turn the cleaner upside down. No need to fuss with trap doors. In just one second, it’s possible to remove the upper section for wide open 360 degree access to the filters. You’ll find not one, but two oversized filter bags. Traditional cleaners with difficult to access filters are a thing of the past. Cleanup is now quick and easy. Conventional all-wheel drive robots employ complex mechanical linkages to distribute power from the motor to all four wheels. This sacrifices efficiency and reliability. In contrast, each Spirit robot is jet driven allowing for a lighter, smaller and more efficient design than its direct driven wheeled counterparts. The Aquabot Spirit is simply the best robotic cleaner value available today. Along with that comes a great warranty. Your Aquabot is backed by a 2 year warranty which is unheard of in the sub-$500 category.